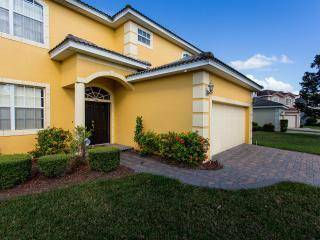 DizneyVista Villa 5 Bed luxury pool home with views of Disney fireworks! SPECIAL OFFER! 20% late availability discount off any available dates within the next 3 months! Welcome to DizneyVista Villa! our luxurious 5-bedroom two-storey vacation home, which contains approx 3000 square foot of accommodation and sleeps up to 11 people. 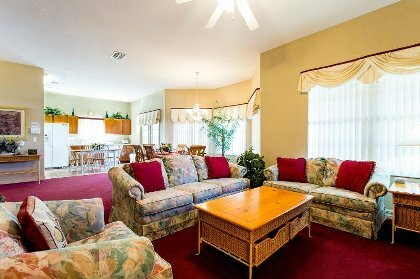 For those seeking privacy our home away from home is the sensible alternative to hotels and it will allow you to holiday in central Florida without compromising your living standards. Our home is located in a gated community on Florence Villa Grove Road, near where Hwys 27 and 192 meet. Walt Disney World is a mere 12 minutes drive away yet our home is nestled in the peaceful and tranquil setting of the gentle orange grove foothills of the Florida Highlands. The bay window of the master bedroom overlooking the pool affords magnificent night-time views of the Disney area skyline, including the nightly fireworks from the Magic Kingdom and Epcot. What better way to finish off a busy day at the park than sitting outside by the pool with an ice-cool drink, listening to the water fountains and watching the fireworks light up the night sky. Our fully air-conditioned vacation home is maintained to an impeccable standard and is ideally suited for two families sharing as it contains two master suite bedrooms (both with king size beds and TVs with cable), a junior suite bedroom with 2 twin beds (and TV with cable and PS2), a double bedroom with a queen bed (and TV with cable) and a bedroom with 2 twin beds (located downstairs with a bathroom across the hallway). The double doors leading out from the house to the pool & deck area are alarmed. With plenty of room for all to relax the Living area complete with a 3-2-1 sofa, coffee table, two occasional tables and a ceiling mounted paddle fan has a peaceful outlook onto the pool area. The entertainment centre contains a large screen TV/DVD with cable. A selection of complimentary dvd films are provided for your enjoyment. A Hi-fi stereo system, with cd player along with a selection of music cds are also provided. The luxury kitchen comes fully equipped. As well as conventional oven and stove, there is a microwave oven, dishwasher, side-by-side refrigerator/freezer with ice maker and chilled water, kettle, coffee maker, toaster, blender, garbage disposal, cookware, utensils, pots and pans, glassware, cutlery, etc. 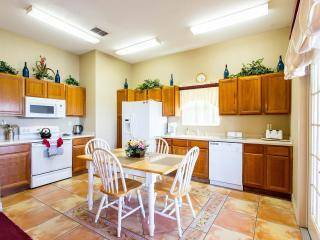 A breakfast table and chairs allows for those quick meals before leaving for the parks or some shopping. pool area has two armchairs for relaxing in and a TV with cable. The bathroom comprises twin vanity units with hairdryer, shower, bath- tub, separate toilet cubicle and a walk-in closet. Master Bedroom 2 has a king size bed, TV with cable, telephone, ceiling mounted paddle fan, 2 nightstands with clock/radio, a dressing table with mirror and built-in closet. The bathroom comprises twin vanity units with hairdryer, shower, bath-tub and a separate toilet cubicle. Bedroom 3 has 2 twin beds, TV with cable and a Playstation 2 with a selection of PS2 games. Ceiling mounted paddle fan, nightstand, a chest of drawers with clock/radio and built-in closet. The bathroom (which can also double up as a stand alone bathroom) comprises vanity unit, bath-tub with shower and toilet. Bedroom 4 has a queen size double bed, TV with cable, ceiling mounted paddle fan, a chest of drawers with clock/radio and built-in closet. Bedroom 5 has 2 twin beds, ceiling mounted paddle fan, a chest of drawers with clock/radio and built-in closet. Located downstairs just across the hall from bedroom 5 the 4th Bathroom comprises vanity unit, shower and toilet. The paved private pool area, which is not overlooked from the rear contains a fully screened pool deck area with a 28x14 foot heated pool and jetted spa complete with underwater lighting and fountains. The pool is 3 foot deep at the shallow end and 5 foot deep at the deep end. The spa is linked to the main pool by a spillway and seats 5 people. A selection of pool toys are also provided. The deck area has also been further extended to provide an additional sunbathing area. 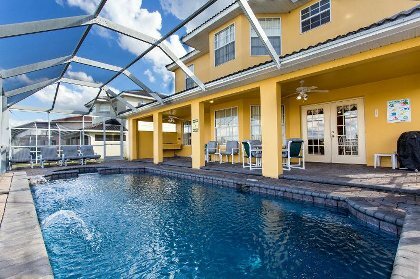 The covered Lanai area complete with gas BBQ/grill and two ceiling mounted paddle fans provides the ideal location for those wishing to stay cool out of the hot Florida sun. A table and 6 upholstered poolside chairs are provided for dining outside, together with 4 upholstered sun-loungers. An additional table, four chairs and four sun-loungers are also provided in the extended deck area. 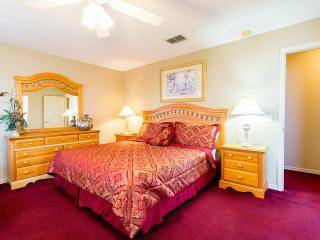 The home is a 40-minute drive from Orlando International airport with Sanford and Tampa International airports a 70 minute drive away. There are 2 Publix supermarkets, a Super Wal*Mart, and numerous gas stations, restaurants, banks and many other convenience stores all located within a two minute drive of the home. Walt Disney World main gate – 12 minutes. Busch Gardens - 60 minutes. There are over 30 public golf courses within a 15-mile radius of our home. Trips to the beach are approximately 75 minutes to the Gulf of Mexico or to the Atlantic Ocean. November 14, 2017 Reviewer: Marlene M.
It had everything we needed. We spent most of our time out by the pool when we weren't out enjoying the Disney parks. Grandkids loved the pool! Would definitely rent again if ever get the opportunity to return to Florida! From the moment we inquired about this home, Aidan went above and beyond with quick, detailed responses. This home is perfect for two families, or 3 or 4 couples. It is obvious that it has been well taken care of, and is stocked with tons of towels, and everything you would need in the kitchen. The pool and spa were warm on our arrival, and there is more than enough outdoor furniture. Little things such as candles in the bedrooms, coffee filters in the kitchen, a small supply of dish soap, bar soap, garbage bags, clearly goes beyond what I expected. 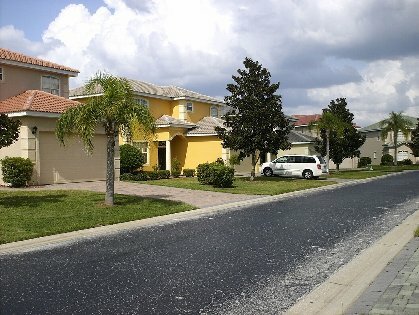 We have rented homes in this general area of Florida for twenty years, and it's a pleasure when you rent from someone that has put that much thought into his guests stay. Great home, and Aidan is a treasure to deal with! Thanks for a wonderful two weeks! November 14, 2017 Reviewer: Troy M.
Great house and great owner! Thanks for allowing us to stay. If you every come to Texas we will show you San Antonio! November 14, 2017 Reviewer: Kevin M.
We really enjoyed staying at this home. It had everything we needed and more. We had two families staying and we had tons of privacy. We have another world series to attend this year and I am sad this house is already booked for that week. Enjoy your stay. I travelled to Orlando for Easter week and had the opportunity to reside at this home. It was nothing less than spectacular. Firsly, it is spotlessly clean, and equipped with everything you would ever need, from iron to hair dryer, dishes, towels, movies, bookes, magazines, and most importantly tranquility. I have three 16 year old boys and could have had three more with me as there is so much room for everyone to have their own quiet space. The pool and spa are incredible. (We opted for pool heat and are very glad we did as even on the scorching hot florida days, the warm bubbly spa was relaxing at night) This home was the perfect option for me and I will use this very house again when I return to Flordia. The resort was wonderful, with lots for my children to do, and the owner of this home was very accomodating,and helpful, and was eager to help make my vacations a perfect one. Groceries and stores were virtually minutes from our home, and Disney was only a short distance as well. We were excited to finish our Disney tours, and simply spend a few days enjoying this house and all it's ammeneties. I would stronly recommend this home to any family with children of any age. I have beautiful pictures and comments and would be more than willing to share them with you to help you make your decision. This location is a vacation in itself. We spent a week in this house with our family of eight and were pleased with absolutely everything. The place was nicely decorated, spotlessly clean, and very comfortable. The staff of the community were very helpful whenever we had questions. I would stay here again if I was coming to the Orlando area. Special Offer! 20% late availabilty discount off any available nights within the next 3 months for stays of 5 nights or more! Prices are for the home regardless of number of guests in the party. $125 per night/$875 per week - from September 1st to May 31st (Excluding Christmas & Easter) $115 per night/$805 per week for stays of 2 weeks or more. $140 per night/$980 per week - from June 1st to August 31st (Including Christmas & Easter) $130 per night/$910 per week for stays of 2 weeks or more. Pool/spa heating is available for an additional charge of $22 per day or $150 per week. The above rental rates are exclusive of sales/tourist tax, which is currently applicable at 12%. 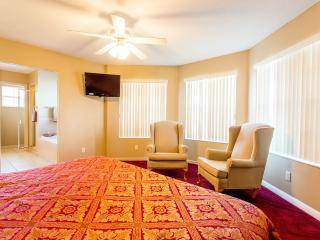 Stays of less than 7 nights are subject to a cleaning charge of $125. A non-refundable reservation deposit of $150 per week (or part thereof) secures a booking with the balance due 45 days before arrival. This deposit is deducted from the total rental amount. In the event of cancellation during the 45 days before arrival a charge of 50% of the rental fee will apply or alternatively reschedule for any other available dates at no extra charge. A security deposit of $250 is payable with the balance. This deposit is refunded in full within 21 days after your stay. Normal check-in time is 4pm and check-out time is 10am. No smoking in the home please - smoking is allowed only outside by the pool. Sorry no pets. Deposit: A non-refundable reservation deposit of $150 per week (or part thereof) secures a booking with the balance due 45 days before arrival. This deposit is deducted from the total rental amount. A security deposit of $250 is payable with the balance. This deposit is refunded in full within 21 days after your stay. Cancellations and Refunds: In the event of cancellation during the 45 days before arrival a charge of 50% of the rental fee will apply or alternatively reschedule for any other available dates at no extra charge. Other Fees: Stays of less than 7 nights are subject to a cleaning fee of $125.